Skinny Chicks Don't Eat Salads author Christine Avanti explains how women and men can control their appetites and lose weight by avoiding the fake and processed foods that are actually making them fatter. Many women think that products labeled "fat-free," "sugar-free," or "lite" are the key to easy weight loss. The truth is that these so-called healthy packaged foods are filled with processed ingredients and chemicals that actually contribute to weight gain by causing us to overeat. 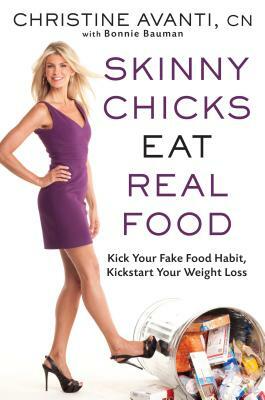 In Skinny Chicks Eat Real Food, nutritionist Christine Avanti explains why a diet rich in all-natural produce, whole grains, and lean protein packed with the nutrients responsible for maintaining stable blood sugar levels and speeding up metabolism is by far the more effective option. Avanti draws on the latest research to provide guidelines for what and how often readers should eat to ensure that pounds are dropped—and offers specific meal plans, grocery lists, and a collection of flavorful recipes filled with fresh, seasonal ingredients. A guide to eating real food in a factory-food world, a weight loss plan, and a real-food cookbook in one, Skinny Chicks Eat Real Food will instruct and inspire readers to steer clear of fake food and eat the balanced, all-natural way we were designed to eat. Christine Avanti is a certified nutritionist, a graduate of West Lake Culinary Institute, and the nutrition director and executive chef at Passages rehabilitation center in Malibu, CA. She lives in Los Angeles.